Dropzone makes it faster and easier to copy and move files, open applications and share files with many different services. Dropzone 3 is a unique and amazing app that's like nothing you've ever used before. 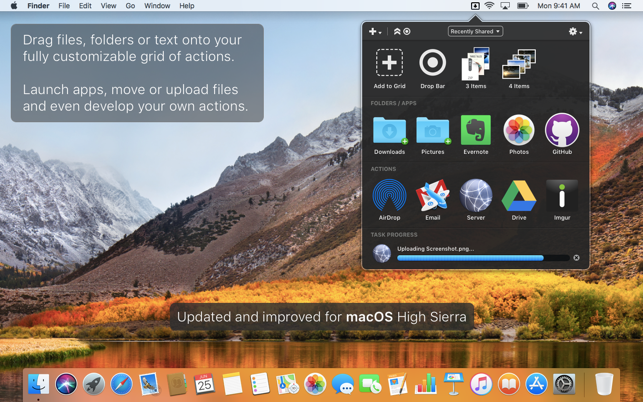 We've paid fanatical attention to every detail and built an app that looks and feels like an integral part of macOS. Dropzone ships with a powerful scripting API and with a little programming knowledge you can modify any of your actions or even create entirely new ones. This gives Dropzone unlimited extendability and utility. We're always thinking up new actions so Dropzone will become even more useful over time. Drop Bar is a brand new feature in Dropzone 3 that makes it easy to stash files you know you'll need later. Just drop files on the target and they stick there until you're ready to use them. You can even combine groups of files into stacks and then drop them onto a Dropzone action or onto another app. Setup your customizable grid of actions how you want and swap in different actions as your needs change. • Open applications, move and copy files faster than ever before. • Shorten URLs quickly using the newly added Goo.gl shortener. Just select a URL to shorten and press Ctrl+Option+Cmd+S and the shortened URL is automatically copied to the clipboard. 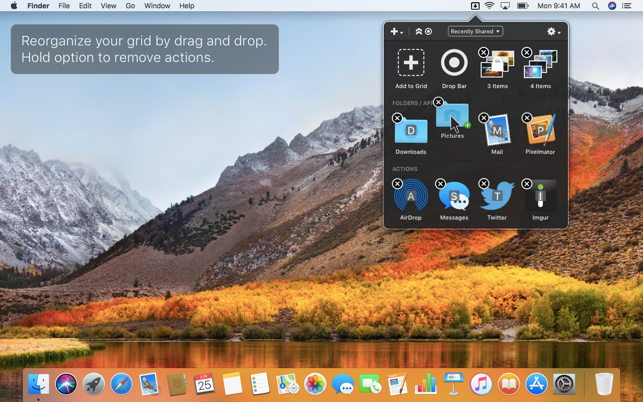 • AirDrop integration lets you drop files or folders from any app and share them with your other Macs over the network. • Imgur integration lets you share images fast and get a link for pasting. It even allows you to drop multiple images to create an Imgur album. You can use it with or without an Imgur account and it comes setup and ready to go. • Upload via FTP and Amazon S3. • Download and install add-on actions that let you upload to services like Google Drive, YouTube and many others. • Notification Center notifications let you know when your actions finish. • Powerful multi-tasking engine allows you to run multiple tasks at once and track the progress of each one through the in-grid task status area. • See how tasks are progressing at a glance in the animated menu item. • Reorder your actions quickly via drag and drop. • Add applications, folders or actions to your grid easily by dragging and dropping them on the Add to Grid area. • Develop your own actions using the updated and massively improved Ruby or Python API. We're always working to improve Dropzone and we're going to bring you many free feature updates and more actions in future. We'd love to hear what you think of the app, you can get in touch via the App Store “Support” link, or tweet us @aptonic. Most Useful App In the App Store!!! I spend a fortune on apps and never wtite reviews! I figure every app speaks for itself to the respected buyer and my opinion should not deter or promote what could accelerate someones work or fun. When this app dropped I thought it looked like something neat to use, but I had no idea it would become my most used app. 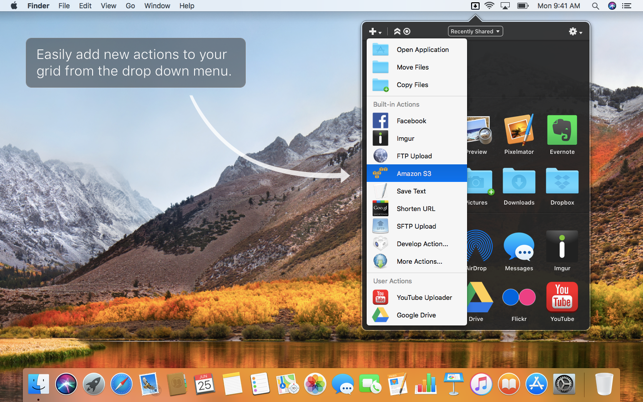 It so simple; quick access to your apps, folders, and files and a place to drop off files and media until you have time to place them or simply keep a copy of your folders in Drop Zone and placing files no longer becomes an issue that clutters up your desktop. It does so much and cost so little for all of the time and frustration it saves! You just have to try it! 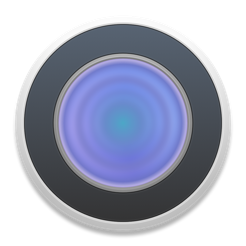 This app is great for streamlining tasks that you would do on your Mac everyday. 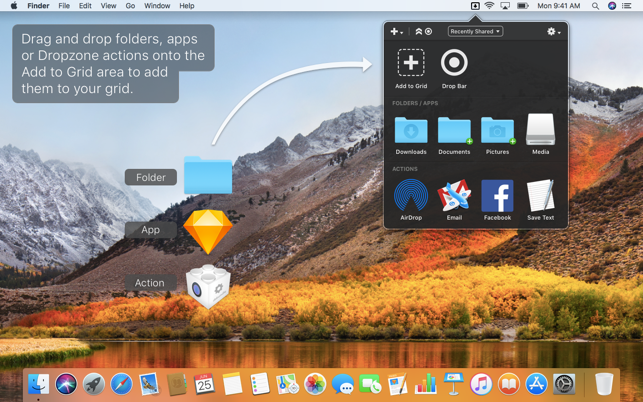 It also helps keeps the desktop clutter down as you can drag an drop whatever you’re working with and place it in with out having to open up a bunch of folders to get to it. (Pre-setup is required) Once you have it setup, it’s a snap. The developer will answer your emails if you have problems, just give him a chance to respond. I know you’re not supposed to save to or leave things on the desktop, but sometimes that is just the easiest way to do something = after which the next easiest way to handle the item is to click and drag it over to DropZone and move it into a folder where I want it to go = I am sure I’m not using it as well or much as possible, but that alone is a great help to me.